In addition to the electronic distribution format the project will make a selection of its digital resources (published on its website) periodically available as an e-book and a printed volume. This web-to-print initiative is part of the project’s long term preservation and information dissemination strategy, combining the traditional publication formats with digital distribution of research data under the label of CC-BY. Principally, project information, in particular stable web contents and publications (DOI) that are released over the course of the project, will be made available in digital format at no cost on the project’s website, which has its own ISSN 2366-5556. The project’s website is established as a blog in the catalog of the German National Library and in the international ISSN Portal. This situation guarantees that blog contents will be citable as a network publication with an open target audience. The first year book has been and can be ordered directly via Books on Demand (http://www.bod.de/shop.html), Amazon or any other distributor. The Year Book for 2014 and 2015 includes online publications that members and associates of the research project have issued on the website www.mayawoerterbuch.de. The first volume gathers ten research reports, working papers, research notes as well as a selection of web contents. 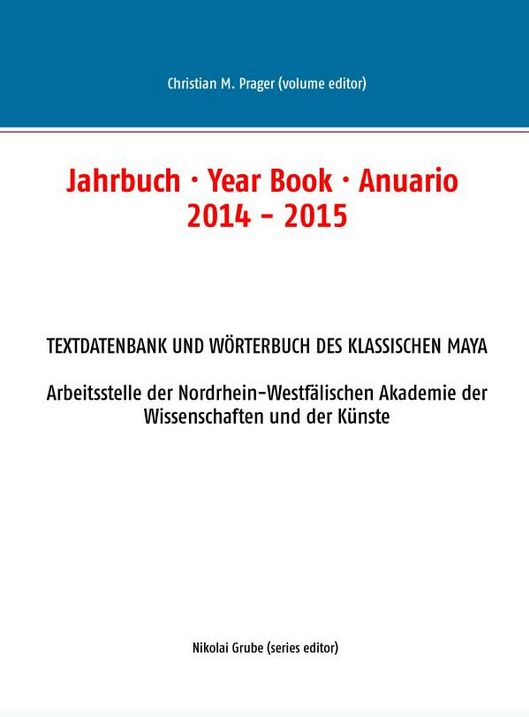 2016 Jahrbuch · Year Book · Anuario 2014 – 2015: Textdatenbank und Wörterbuch des Klassischen Maya, Arbeitsstelle der Nordrhein-Westfälischen Akademie der Wissenschaften und der Künste. 284 pp. Books On Demand, Norderstedt. ISBN 978-3739245935.